If you love to splatter on your cookbooks (we do! 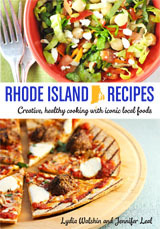 ), order Rhode Island Recipes in print. Click on the image above. On sale for only $4.99! Please come on down to Dave's Marketplace in East Greenwich this Friday, October 25th from 3-6 p.m. for our book signing and free food sampling. Dave's is selling the books at a price of $15 for this event and their own chefs are whipping up three of our favorites recipes from the book, but you have to come find out which ones. In addition to sampling some of our recipes, you can sample the cheese offerings from Narragansett Creamery (prepare to fall in love with their products). We are looking forward to chatting with you before you do some grocery shopping and head home to relax. We are thrilled to announce that the print version of the Rhode Island Recipes cookbook is now available at the Wright's Farm gift shop. Wright's Farm was once a working farm but evolved into a landmark restaurant and a very impressive gift shop. Be sure to add the restaurant and gift shop to your 'must do's' next time you are in northwest Rhode Island. Cookbook & Culinary Souvenirs Twitter Party including GIVEAWAYS! We have an exciting party in the making, and we hope you can join us! Tomorrow, August 5th from 4-5:30 p.m., Rhode Island Recipes is being featured during the Foodies Nite In Twitter Party. The topics of conversation, besides our cookbook, will include cookbooks in general as well as culinary souvenirs. As an added bonus, we will be giving away our cookbook, as well as two bottles of Dave's Coffee Syrup. Please join and bring your friends. Who: @cookingwcaitlin, @foodiesnitein, @savorthethyme, @perfectpantry, @RIRecipeBook, and YOU!! If you've never been to a Twitter party, it's easy to join in. Just search for the hashtag #FNIchat, and jump into the conversation. There will be questions posed by the moderator, and by following the hashtag you'll be able to see everyone's answers, and step right up with your own. A couple of weeks ago, Gail Ciampa, food editor of The Providence Journal, and photographer Sandor Bodo joined us in Jennifer's kitchen to talk about Rhode Island Recipes. The article, featured in today's food section, really captures the spirit of the book and celebrates cooking creative, healthy dishes with Rhode Island's iconic food products. Go Local! Our favorite recipes for Fall, on golocalprov.com.